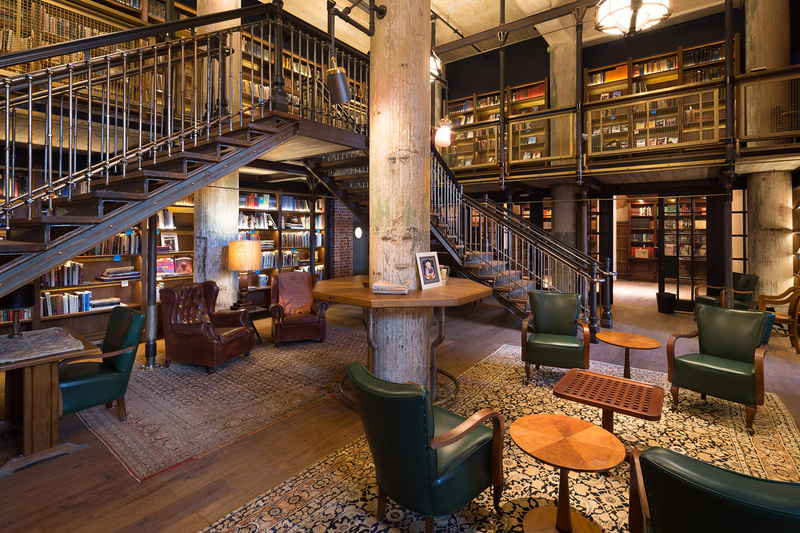 Shopping the internet for hotel lobby inspiration has opened new avenues of design — or do I mean that it’s re-opened old ones? At the heart of Frank Lloyd Wright’s 1889 Oak Park home is an inglenook, a cozy alcove centered on the hearth and flanked by two cushioned seats where one can imagine the young Wright of an afternoon with the poetry of Rimbaud. The Germans, typically, have a word for such nooks: Gemütlichkeit, discussed at uncharacteristic length by Wikipedia. Gemütlichkeit derives from gemütlich, the adjective of Gemüt, which means “heart, mind, temper, feeling” expressed by (and cognate with) English mood…. English has no direct translation for Gemütlich or Gemütlichkeit. Cosy captures an element of it but crucially lacks those of friendliness and belonging. Stemming from the Scottish Gaelic word còsagach, cozy means “1 Full of holes or crevices. 2 Snug, warm, cosy, sheltered. 3 Spongy”, according to Edward Dwelly’s Scots Gaelic – English dictionary. And in characteristic 19th century fashion, these retreats were inscribed with ennobling and introspective mottos. 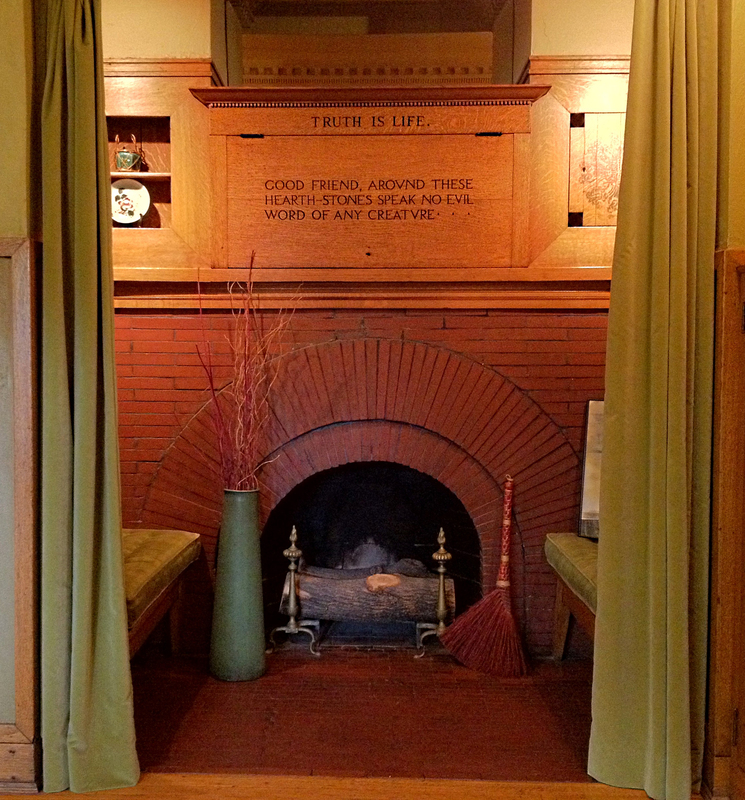 Two are carved in quarter-sawn oak above Wright’s diminutive arched fireplace: “Truth is Life” and the directive “Good friends, around these hearth stones speak no evil word of any creature.” How often do you think Wright followed his own admonition? There is already a prominent motto on the door to Anson Tennant’s architectural studio, a phrase also branded into each piece of Gustav Stickley’s furniture — Als Ik Kan — a Flemish phrase that also lacks adequate English translation. “As best I can” or “to the best of my ability” conveys the idea, no doubt what young Tennant hoped to impress upon his clients; the underlying motive of the Arts & Crafts movement. Motives, maxims, mottos. They appeared everywhere in the years between the Civil War and First World War. In homes like Wright’s (for both himself and his early clients); above the entries to court houses and other public building; around the walls of public school classrooms; in lodge halls and other clubs; it would have been impossible to avoid their counsel during the course of your day. I recall one from a fifth-grade classroom: “Good, better, best. Never let it rest. Until your good is better and your better best.” So, I’ve begun a collection for inclusion in the entrance of the Agincourt Public Library. Obviously they have to predate the library’s 1915 construction. Suggestions are appreciated. ¹ If you aren’t familiar with Ms Behn, she was an English playwright and contemporary of Wm Shakespeare but perhaps even bawdier. The Shades is Agincourt’s formerly-Protestant, now non-sectarian cemetery located at the east edge of the original town site. Odd that I’m willing, even eager, to engage its design, while I’m constitutionally unable to cope with The Square and its focus on the memorialization of War. The cemetery name, The Shades, invokes a decidedly non-Christian mythological reference to the dead — “the spirit or ghost of a dead person, living in the underworld” — reaching back to the middle of the 18th century and its fascination with the beautiful, the picturesque, and the sublime. Subtle distinctions lost on most of us today. 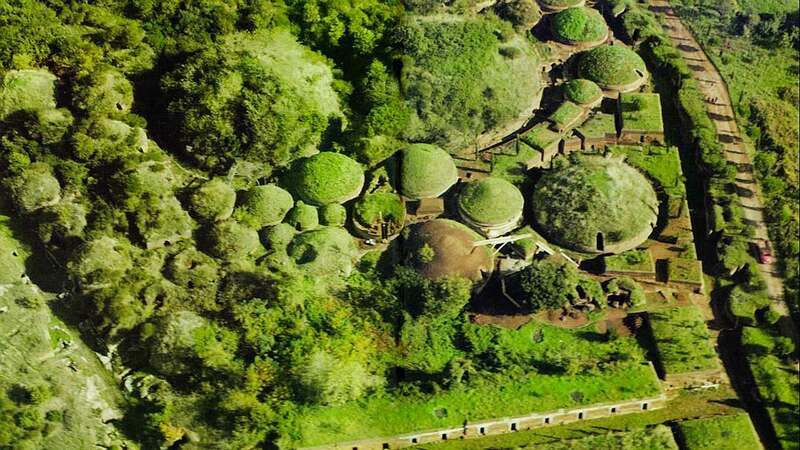 Indeed, cemeteries are little-visited by anyone under the age of fifty, if at all, and only under duress. I have only fond memories of Saturdays with my grandmother visiting the grave of her husband, my grandfather, Roy L. Ramsay (for whom I’m partially named. We’d pack a shopping bag with some lunch and small garden tools, then walk the two blocks to the bus stop on Archer Avenue (by the Moffet Technical Center, but that’s another story) and await the Bluebird suburban bus. The Bluebird ran this route from downtown Chicago southwest all the way to Joliet, and along those forty-five miles there were several large suburban cemeteries: Bethania, Resurrection, and finally Fairmont, where we had family plots. There’s a fourth at St. James-at-the-Sag, but that’s too far. Alighting from the bus, there was a greenhouse where my grandmother purchased geraniums, then crossed Archer and passed through the gates. It was a hike up the hill along a winding road between several mausolea—not much vanity at Fairmont—until we came out on the broad flat southeastern (and far less picturesque) portion of the place, with few trees and much more orderly placement of graves: efficient, economical. Jeffersonian, like rural America; gridded, like Chicago. We’d remove grass and weeds from around the headstone, a distance of three or four inches. Then plant the geraniums, one or two on either side but always symmetrical. My job was carrying water from a spigot some distance away. Odd that I don’t recall what I used to carry the water. Then we’d have lunch, enjoy the passing clouds, the breeze, and finally walk back to the bus stop at the bottom of the ravine for the trip home. This was an important part of my childhood rhythm. I’ve imagined just one special interment at The Shades: Agincourt’s half-term mayor Edmund FitzGerald Flynn and, some years later, his widow Amity Burroughs Flynn, a far more savory character than hizzoner. 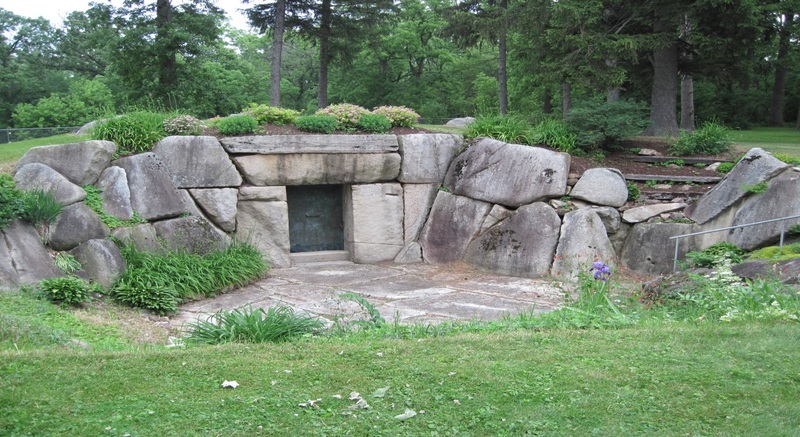 But their mausoleum is also far less romantic than the example pictured above, the former Medill McCormick tomb at Winnebago, Illinois.”² It’s time for me to tackle the larger, fuller story of Agincourt’s rhythms of death, burial and commemoration. ¹ Many thanks to Dr Carol Andreini for her translation into ancient Greek of this phrase, inscribed at the public entrance to The Shades. 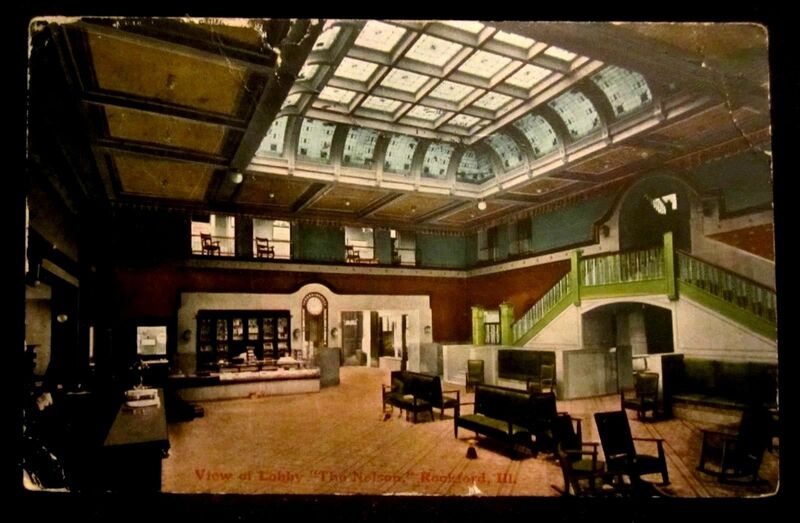 ² The McCormick tomb was designed in 1927 by architect Raymond Hood, far better known for his Art Deco and Moderne design. Vandalization of the tomb by teenagers seeking a place to drink caused the family to relocate the burials and destroy it in the 1970s. So I feel at liberty to “borrow” the Medill tomb for The Shades. 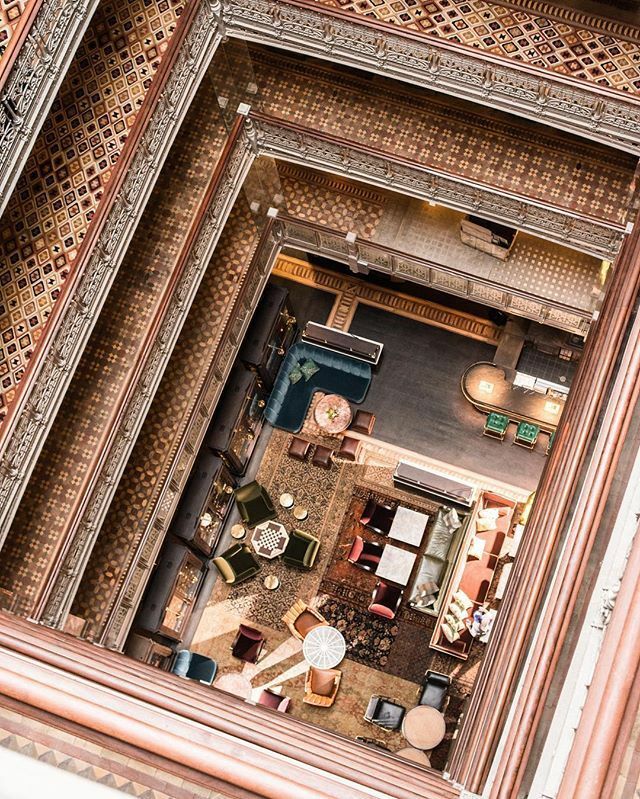 Hostelry is an entire topic for discussion; its evolution as a building type is as varied as any other and it also opens wonderful opportunities for both staffing and patronage, not to mention questionable and outright elicit behavior. 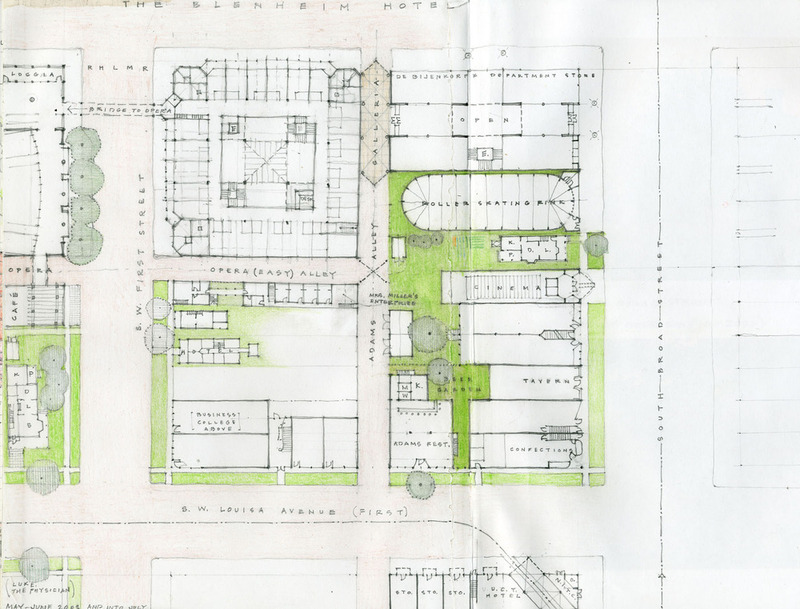 This site in the teens block of west Agincourt Avenue had been occupied by an earlier hotel, an accident-prone place appropriately named Hazzard House, which also accounts for its destruction by fire about 1900. Accidents such as that are a convenient opportunity top introduce new buildings and different architectural styles—not to mention interesting new characters. The Blenheim is just a three-story building, a doughnut of services and rooms wrapped around an interior light court, a palm-laden inversion filled with cigar smoke and the melding of multiple conversations. It would surely have been the site of elegant events, tuxedoed, sequined, and filled with people wanting to see and be seen. 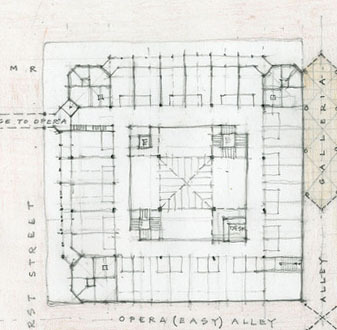 Typically, I’ve conceived the building in plan alone, elevations being my nemesis. 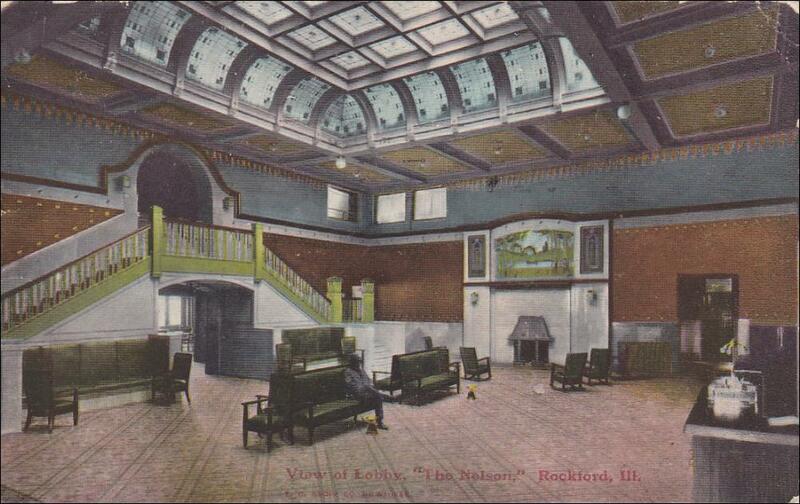 Then I ran across the interior lobby of the Nelson hotel in Rockford, Illinois, which can be a guide for any perspective I might attempt. The Nelson itself had many more stories than these two, so that skylight must have been at the bottom of a multi-story void—and afforded many opportunities for leaking. But the bare bones of these two views can be adapted in what I hope will be a far less heavy-handed style. Long before the Montgolfier brothers helped us slip those surly bonds, artists and cartographers (an artificial distinction, at best) relied upon their mind’s eye, an ability to extrapolate aerial aspects of the world as it might be seen from above the highest steeple or handy barbican. The Flemish-German painter-engraver-mapmaker Franz Hohenberg,¹ imagined such views for the major cities of his age for Civitates Orbis Terrarum, published in multiple volumes during 1572-1617. The hot-air balloon would have made their task far easier but, hopefully, no less fanciful. I suppose we may characterize their process as inductive, developing the holistic impression of a city by accumulating myriad bits and pieces of information — such as Hohenberg’s view of Poznan and its hinterlands, published in 1617. 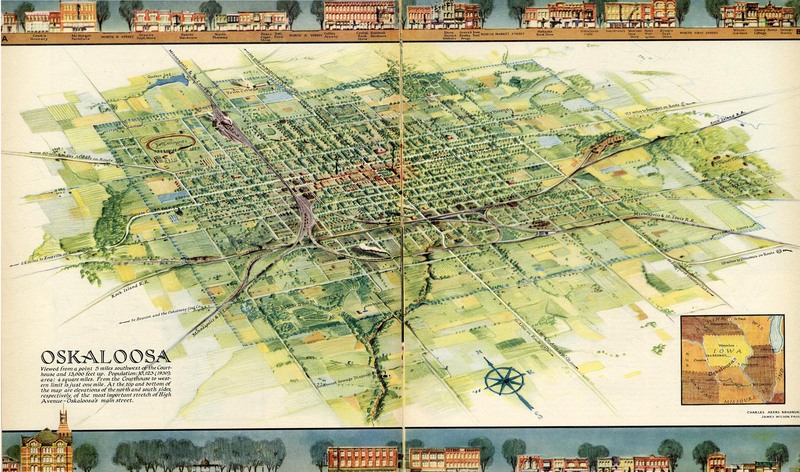 Other than their methods for gathering the necessary data, I find more similarity than difference between the image of Poznan and another more than three hundred years later of Oskaloosa, Iowa, rendered by illustrators Charles Akers Bradbury and James Wilson Paul for the April 1938 issue of Fortune. Today, of course, computer simulations of Agincourt, Iowa as seen from a drone would be child’s play — oh, but would that I were such a computer-savvy child. And my embrace of creative distortion might only compound the problem. 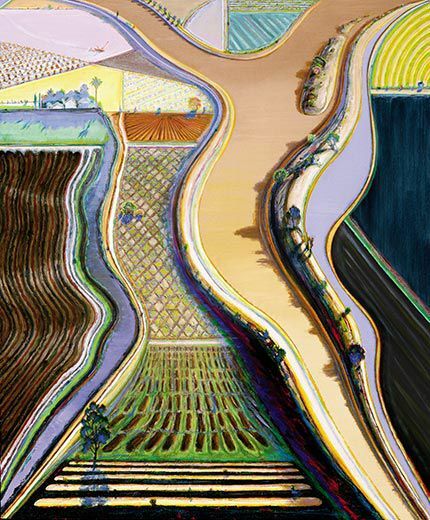 Working on an entirely different project this morning, I recalled the work of California artist Wayne Thiebaud (born 1920), better known for his impasto cupcakes but more recently turned to aerial landscapes of the Sacramento River valley in central California and streetscapes of San Francisco. And Thiebaud’s “Brown River” brought to mind the colored-pencil poetry of landscape architect Barbara Stauffacher Solomon. 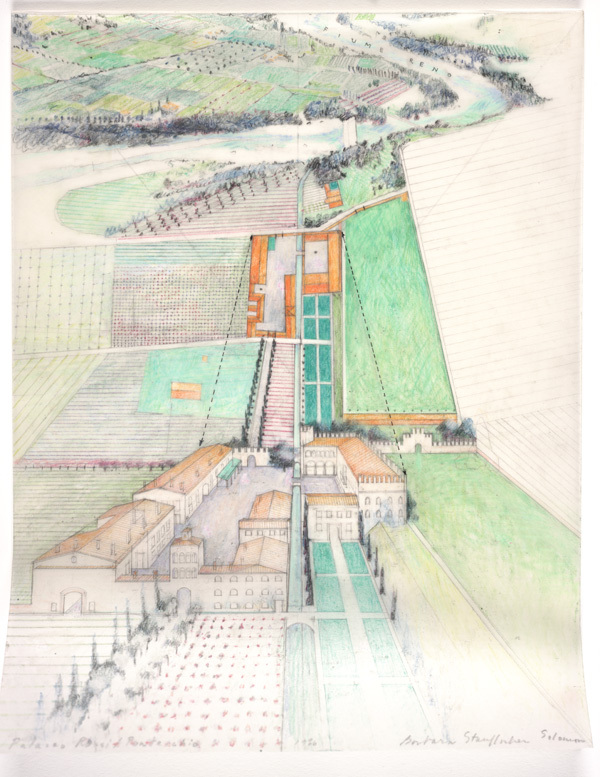 I somehow feel that an aerial aspect of Agincourt might result from the melding of Thiebaud’s mind-warping vision with the WPA-like qualities of Messrs Bradbury and Paul. 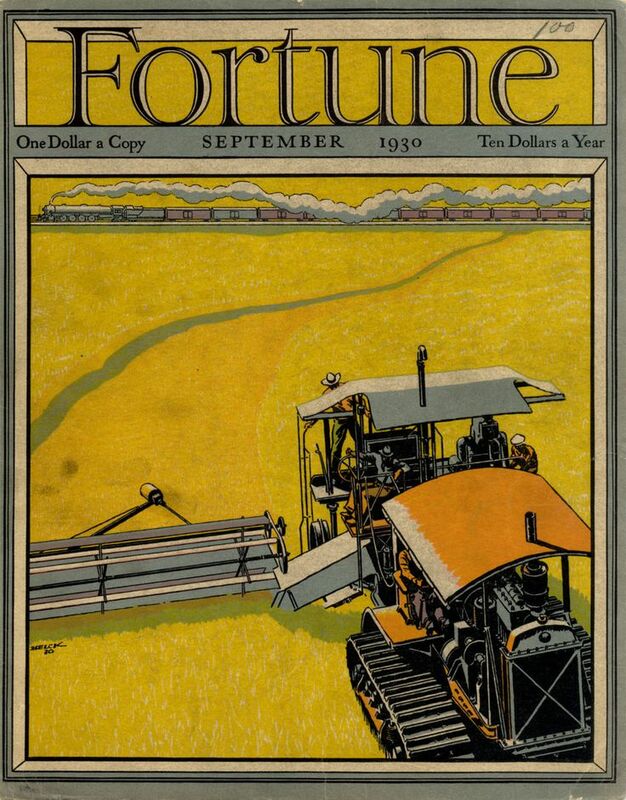 Fortune Magazine published some of the finest cover art of any American mass-circulation periodical. I’ve posted one before that I thought might be inspiration for an aerial view of Agincourt, perhaps some time in the 1930s, which is the date of that issue (April 1938). Searching for another copy of the image, this wondrous two-page spread materialized and I have to reevaluate my first choice, as handsome as it may be. Is there time, do you suppose, to produce something as grand as this for Agincourt? The amazing thing is that this is of another Iowa community — Oskaloosa— thougyh I haven’t a clue what sort of article it might have accompanied. A memorable episodes of Rod Serling’s “Twilight Zone” pits a news conglomerate against The Courier, a humble local daily. Mysterious Mr Smith, portrayed with sinister glee by Burgess Meredith, arrives in the nick of time to save the day. Suddenly, each issue of the Courier scoops the competition, publishing the news almost before it happens. Editor Douglas Winter (actor Robert Sterling) nearly enters a Faustian contract for the promise of continued success. It ends happily, you’ll be pleased to know, when Winter rejects Smith’s offer and the “printer’s devil” disappears in a puff of his own ever-present cigar smoke. The Plantagenet may be at its own commercial crossroad, outpaced by electronic media and underpriced by other advertising modes. I’ll have to ask Howard if he’s been shifted to custodial work. So the traditions of independent journalism are under threat (here as elsewhere) and with it the tactile pleasures of handset type. Or so we thought. 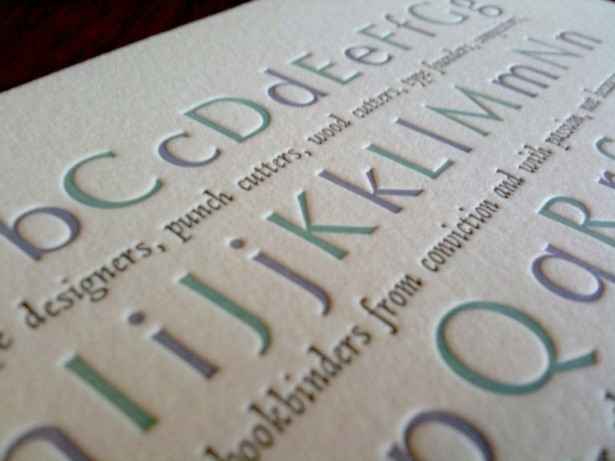 Letterpress printing is on the cusp of renaissance, with print shops appearing throughout the country but especially here in the Midwest. Visit the websites of Studio on Fire in northeast Minneapolis or Fire & Ice in St Paul to see what I mean. [What is it with these fire references?] So it’s highly likely that the derelict type fonts and platen press of the old Needle & Haystack print shop may join the letterpress revival. 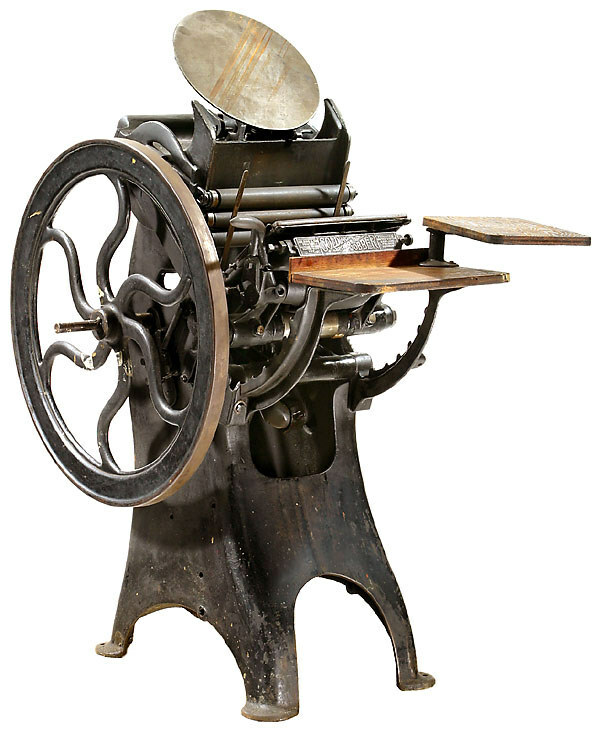 The Needle & Haystack firm spun off from The Plantagenet in the 1890s, when printing was profitable and Mergenthaler linotype machines revolutionized the industry. Neither of the print shop’s founders bore those surnames, however — neither Needle nor Haystack — nor were they Agincourt-born. More about that later. Nineteenth century city directories were a mainstay of local printing operations. Though they were published just once a year, everyone wanted a copy as did folks in towns across the region and advertising revenues, from page margins to full-page spreads, made them profitable. And even before the widespread use of telephones, directories were used to locate people, target direct-mail advertising, and track the increase of population for statistical use. 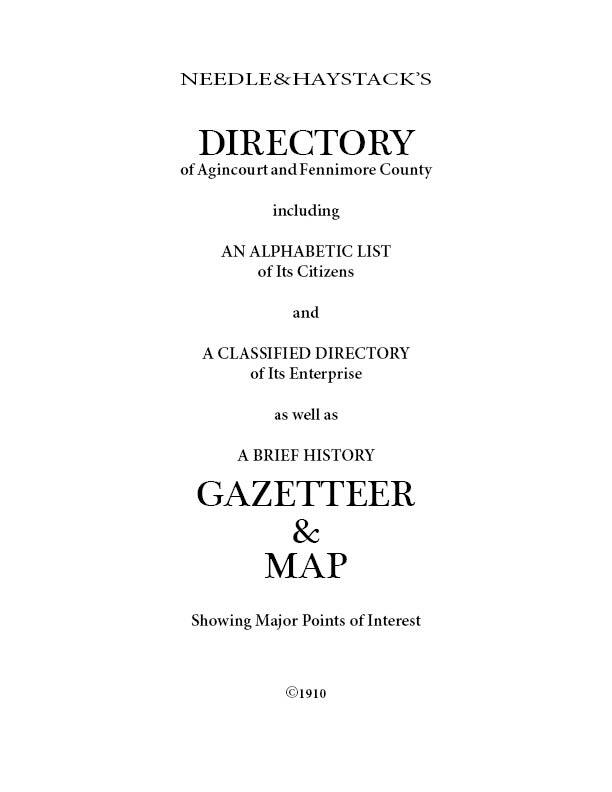 A virtual annual census, communities could use its information to promote themselves; hyperbole can take several forms, even such as Needle & Haystack’s Directory.¹ The large font, by the way, is “Plantagenet Cherokee,” a highly appropriate choice. ¹ For a nearly complete collection of Agincourt directories, visit the library at the Fennimore County History Center and Living Museum.